> This article will examine how the author adapted popular strategy board game Settlers of Catan by Klaus Teuber for use in large-group year 6 (11-to-12 years old) elementary school second language classes, offering learners a safe, engaging, team-centred environment in which to recall and implement previously learned communication strategies utilising simple functional language. Games have a long history as valuable and fun learning tools. Whether as experiential language activities which allow students “opportunities to use language as they grapple with the problem-solving complexities of a variety of concrete experiences”,1 or as active learning tasks through which participants are “more likely to internalise the lessons and experiences”,2 they are versatile enough to meet a broad spectrum of learning needs in education, business, the military, and a variety of other spheres. A goal to provide purpose and focus attention. Rules which limit player actions and force creativity in pursuit of the goal. A feedback system for motivation and to track proximity to the goal. Voluntary participation to ensure player buy-in and a safe environment for dealing with in-game challenges. Settlers of Catan is designed for 3-to-6 players, but for classroom purposes each player was represented by a team of up to four students. Students were given specific roles, the rules were simplified, and 90 minutes allotted to each game. 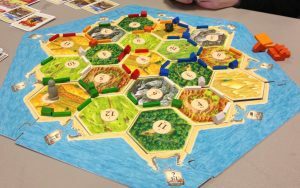 Using McGonigal’s framework, the goal of Settlers of Catan is to accrue victory points, won by building towns, cities, and connecting roadways on a resource-rich map board. Five types of natural resource cards form the currency of the game. The rules set the order of play, permissible actions, and mandate the resource card combinations needed to purchase roads, towns and cities. Feedback is provided by tracking victory points. There were two aspects to voluntary participation: students were invited to play, and once playing, could be as active or as passive as they wished. They quickly saw that the game rewarded active involvement, and this proved motivating. Learner participation took four forms, corresponding to game phases and assigned roles. Resource gathering. In the harvest phase of each turn dice were thrown to find which resource cards could be harvested by whom. Each team’s ‘harvester’ would then come forward and use a request function4 to collect cards from the resource bank. Building. Teams used resource cards in set combinations to buy improvements. The teams would decide what to buy and ‘builders’ would make the purchase from the bank using a request function. Planning. Teams discussed what and where they would build, which resource cards to trade, and with whom. Planning was ongoing at all times, and took place in both the L1 and the L2, as L2 levels could not accommodate strategy discussions. The voluntary and engaging nature of the activity kept learner motivation and participation levels high, while the safety of the game world subverted normal class hierarchies. Many students were prepared to participate more actively than they would in a normal class, and it was both notable and pleasing that some usually reluctant students took on leadership roles in the game. The learners were mostly able to use simple functional exponents to make requests, signal wishes and agree or disagree, but sophisticated planning in the L2 was beyond them, and trading was done in a mixture of the L1 and the L2 because the teacher could not provide scaffolding support for individuals as well as oversee the game. Reviewing useful functional language, pre-teaching resource card vocabulary and role-playing barter situations in classes leading up to the game sessions would better prepare students to trade in the L2. This Settlers of Catan exercise supported Scrivener’s contention that “[c]hildren may not see the point of English. But they do see the point of doing interesting tasks, games and activities”.5 The game form effectively engendered engaging and meaningful context for the use of level-appropriate functional language, and is, I feel, worth continued exploration. Please see the digital version of the IH Journal for references. Aaron teaches in Japan and is interested in innovative ways of combining theory with practice. Back to Classroom Ideas, Issue 44: June 2018 of the IH Journal of Education and Development.